So many influences have informed Stevie Parle’s cooking at his Dock Kitchen restaurant in west London, on which this book is based. Cooking in iconic London restaurants the River Cafe, Moro and Petersham Nurseries before working in New York, Tokyo, Malaysia and Sri Lanka is quite a mix. Reading the Dock Kitchen Cookbook you quickly realise that despite being influenced by so many different cuisines, there is a common theme to these dishes. Most, as Parle himself says, are "home cooking of one form or another from one place or another". They are closer to "the cooking of the grandmothers of the globe" than much restaurant food. Here we clearly have a chef who loves to eat as well as cook. The journey starts with a simple Iraqi White Bean soup and travels seasonally through Catalonian Fish Stew, Italian Chicken Roasted in Milk & Sage, southern Indian vegetable thorans, Thai Grilled Quail, Chinese Duck & Mushroom Congee and Mexican Pork Shoulder. There’s a small but appealing chapter on Sweet Things, including a fragrant Persian Rice Pudding and a boozy take on the classic British Summer Pudding. Wild Foods, Spice Mixes, Breads, Pickles & Chutneys are briefly covered too. This book is all the encouragement you need to discover what to do with those dried limes or pomegranate molasses in your local ethnic food shop. Helpfully, there is also advice on what to do if you can't find an ingredient. Most of the recipes are admirably concise, showing restraint both in elements and method resulting in an economical dish. 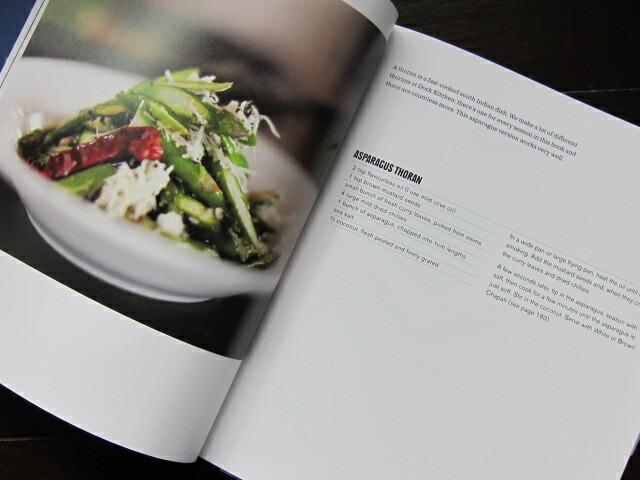 The Dock Kitchen Cookbook is packed with recipes I want to cook and eat.